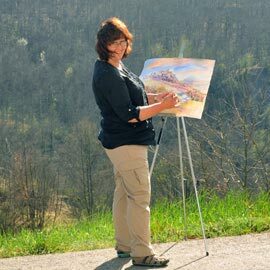 Karen is a painter, sculptor, and an experienced tutor of drawing and painting. Her studios are based in the Lot et Garonne (France) and in Surrey (UK). 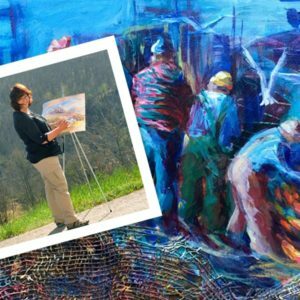 She has been leading and teaching painting trips around the world since 2011 and her work is often influenced by her travels. She trained at the Pound Farm School of Painting & Drawing under Ken Ray and then went on to achieve a full distinction in Fine Art HND(Farnham, 2006) followed by a BA (Hons) Fine Art at Wimbledon College of Art (University of the Arts London, 2013). Karen is inspired by the magic of the natural world, by moments in time and the richness of life that surrounds us. Experienced in drawing and painting a wide range of subjects, her work varies from the figurative to the semi abstract. She works with oils, inks, acrylics, mixed media and pastels, although her main discipline is watercolour enjoying its ability to move and merge on the paper, its subtle and vibrant qualities and, on occasion, its unpredictability. For a succession of years, Karen has exhibited and sold at the Mall Galleries, at Westminster Central Hall, and at the Llewellyn Alexander Gallery, London. She was a former member of The Society of Floral Painters and Surrey Figurative Artists in the U.K. She has received many awards for her work. which is held in private collections internationally. Galleries of her work, which include paintings, sculpture and trompe l’oeil murals, can be found on her website www.karenpearsonart.com. “I am really looking forward to tutoring at Bardi. I will be giving mini demonstrations and tutorials throughout the holiday, and be there to give you as much help as you need! We will cover various subjects that will be relevant to your surroundings and experiences. These will include colour perspective, drawing and painting skills, market scenes, capturing the Italian light and shade, a Parmesan cheese farm, the wonderful Apenine landscape, traditional buildings and old villages, etc. The temperature will be mid twenties so we will take the opportunity to work outdoors as much as possible and enjoy the wonderful choice of subject matter. Paintings produced from life have a freshness and spontaneity unmatched when working from photographs. Above all, you will receive lots of individual tuition. I am very happy to encourage those of you who wish to take a more abstract or design approach to your work as a lot of exciting ideas and inspiration can be sourced from a new environment. So this is an invitation to join me in exploring the visual and artistic delights that this picturesque part of Emilio Romagna has to offer!” KP.